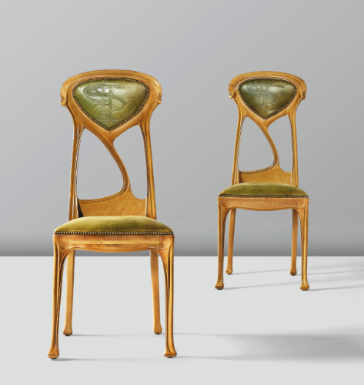 The Sotheby's Art Nouveau sale in Paris (16 Feb) has some spectacular offerings including this beautiful pair of pearwood and leather chairs (circa 1900-1910) by Hector Guimard (1867-1910). A true exponent of the Art Nouveau style, Guimard's work is characterised by sensuous lines and vegetal curves of which these chairs are a truly outstanding example. Lot 92 with an estimate of €30,000-50,000. 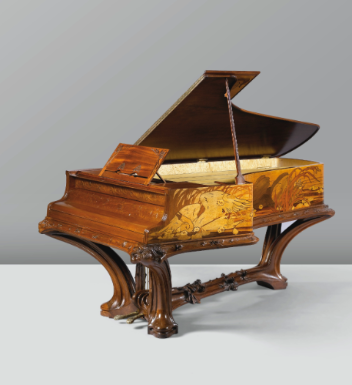 This magnificent baby grand piano by Louis Majorelle (1859-1926) and Victor Prouve (1858-1926) took our breath away. In carved mahogany and fruitwood marquetry inlay depicting 'The death of the swan' on one side, it is signed, dated 1903 and numbered. The ornate carving and sweep of the legs perfectly balances the solidity of the body. Lot 55 with an estimate of €500,000-700,000. 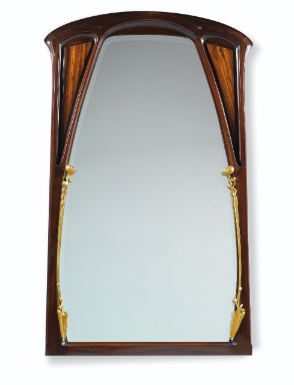 Also by Louis Majorelle is this theatrical mirror ('Miroir aux Nenuphars') in mahogany and gilt bronze. Circa 1900. Lot 45 with an estimate of €15,000-20,000.